Strontium is a soft, silvery metallic element of the alkaline-earth group that occurs naturally only as a sulfate or carbonate. It is the chemical element with symbol Sr and its atomic number 38; atomic weight 87.62; melting point 769°C; boiling point 1,384°C; specific gravity 2.54; valence 2. 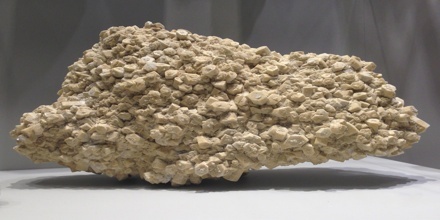 One of its isotopes is used in the radiometric dating of rocks. Because strontium salts burn with a red flame, they are used to make fireworks and signal flares. Strontium occurs naturally in the minerals celestine, strontianite, and putnisite, and is mined mostly from the first two of these. While natural strontium is stable, the synthetic 90Sr isotope is radioactive and is one of the most dangerous components of nuclear fallout, as strontium is absorbed by the body in a similar manner to calcium. Natural stable strontium, on the other hand, is not hazardous to health. Strontium metal itself was isolated in 1808 at the Royal Institution in London by Humphry Davy by means of electrolysis, using the method with which he had already isolated sodium and potassium. Strontium is classified as an “Alkaline Earth Metals” which are located in Group 2 elements of the Periodic Table. An Element classified as an Alkaline Earth Metals are found in the Earth’s crust, but not in the elemental form as they are so reactive. Instead, they are widely distributed in rock structures. Nearly 75% of all the elements in the Periodic Table are classified as metals. 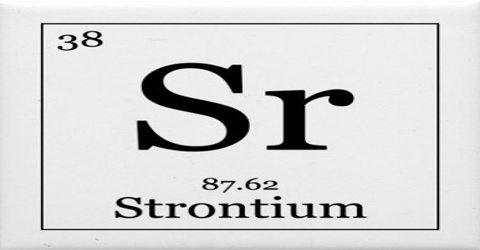 Strontium is softer than calcium and decomposes in water more vigorously. It does not absorb nitrogen below 380 C (716 F). It should be kept under kerosene to prevent oxidation. Three allotropic forms of the metal exist, with transition points at 235 and 540 C (455 and 1,004 F). 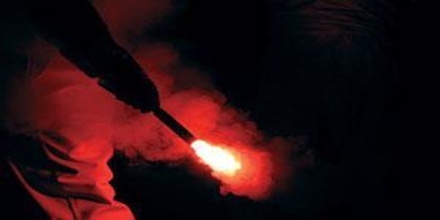 Strontium is best known for the brilliant reds its salts give to fireworks and flares. It is also used in producing ferrite magnets and refining zinc. The world’s most accurate atomic clock, accurate to one second in 200 million years, has been developed using strontium atoms. Strontium chloride hexahydrate is an ingredient in toothpaste for sensitive teeth. It is a product of nuclear fallout and its presence can cause health problems. 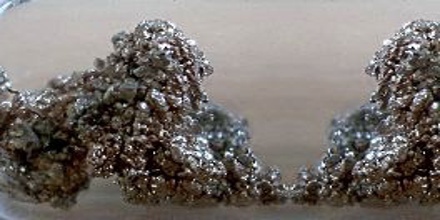 This isotope is one of the best long-lived high-energy beta emitters known, and is used in SNAP (Systems for Nuclear Auxiliary Power) devices. These devices may be used in space vehicles, remote weather stations, navigational buoys, etc., as well as where a lightweight, long-lived, nuclear-electric power source is needed. Reference: elementalmatter.info, rsc.org, dictionary.com, livescience.com, wikipedia.